Comfortable, spacious and lovingly renovated holiday house. Sitting at the poolside, you'll enjoy the wonderful landscape around you: sunflowers, vineyards and tranquility. A lovely garden adjoins the house where a few trees offer shadow and cheerful flowers make the picture complete. The friendly town of Eauze (25 km) is great for shopping, viewing old architecture and tasting regional dishes. The museum 'Le Trésor d'Eauze' displays more than 28,000 coins from the 3rd century. Thursday is market day. 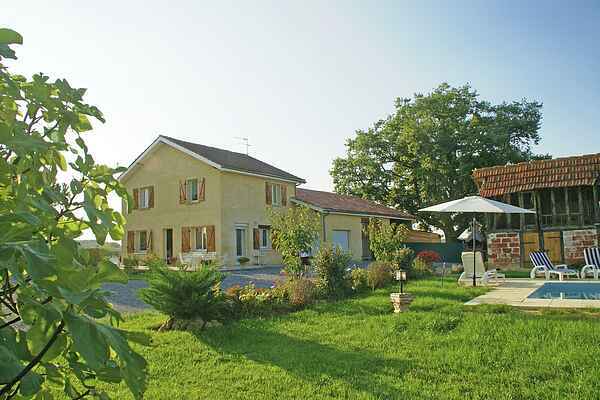 Aignan (3 km) has a bakery, market, post office and swimming lake. Visit the medieval town of Auch (60 km) with its monumental steps, 15th century cathedral of Sainte-Marie and the 40 metre-high prison tower, Tour d'Armagnac. The city is renowned for its large statue of D'Artagnan, the most famous of the three musketeers. He was born around 1610 in the castle of Castelmore near Lupiac (13 km). Music lovers can drive to Marciac (30 km) where you can make a voyage of discovery through time in the Jazz museum.